for the perfect summer picnic. Picnics, as we Americans know them today, date back to the middle of the 19th century. We tend to enjoy the “traditional American favorites” served on a blanket in the country, or celebrated by an extended family in an urban park or a simple spread of bread/ cheese/grapes and wine shared between two. But making your picnic special requires preparation, creativity and of course, a great menu. Macomb Now went to Chef Pete at Nino Salvaggio to get some great picnic recipes and to hear his take of the perfect summer picnic. 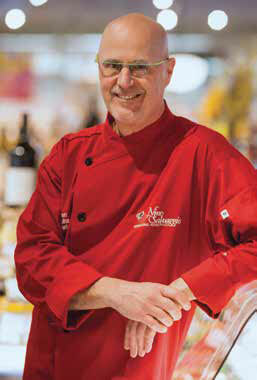 Pete has been with Nino’s for 13 years, and oversees all food products as the director of culinary development. Before Nino’s he worked in fine dining and taught culinary arts. He is their food expert, but here he is our Picnic Expert. “Think about the setting of where your picnic will take place. Do you need to invest in a blanket with a water barrier? Will you be using a table or two? How many people will be attending and will you be cooking for all of them, or sharing the cooking?” All things Pete suggests you begin thinking about when preparing for your picnic. Size dictates. Chef Pete put picnics into three categories. The family picnic is the most common, where the cook has the advantage of knowing his family’s taste so he can create his food as the center. Chef Pete recommends cold food that will keep in a small container like a picnic basket or cooler foods such as sandwiches, salads and simple deserts. “Choose items that don’t spoil that you can cook ahead and they won’t melt or wilt after being out,” said Chef Pete. The romantic picnic, according to Chef Pete, is a picnic you should show some adventure in. Try to impress, be creative, and show how much you care. When you do this, the thought is what matters. Plan it out even down to what you will talk about. Make it special, go gourmet, get glamorous, don’t cut corners. Pick the nicer wine, try something new and be focused on the moment. You might want to leave the phone in the car for this one. The large picnic includes more than just family. Here you can be fun and creative and let guests be independent. Maybe do a build your own – and provide all the different insides to make sandwiches. Get some fun and interesting dips and spreads that aren’t typical. “Let people try new things which will create great conversation. Nino’s has lots of products to choose from,” said Pete. He also suggests you bring along a number of snacks and beverages to keep everyone satisfied before and after the meal. This includes nuts, delicious fruits and vegetables, olives, artisan breads and cheeses, local craft beers and Michigan wines. Our Macomb Now Summer Picnic is more of the romantic type where you can picture your sweetheart sitting on the blanket enjoying a nice bottle of wine under a shade tree at George George Memorial Park. Chef Pete prepared a chilled pasta salad using a local favorite, Rinaldi sausage, some sandwich wraps, a fresh herbed watermelon salad, his fruit crisp recipe along with Tiramisu Creme Dip for dessert. We have included two recipes to get you started but all recipes can be found in our Summer Picnic Supplement.